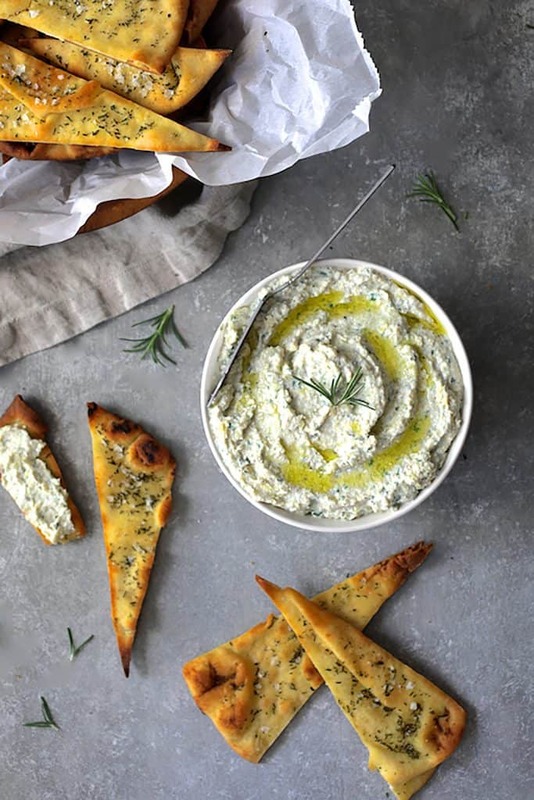 White Bean Artichoke Spread with Rosemary Sea Salt Flatbread Chips is an easy and elegant appetizer that’s perfect for entertaining or wholesome snack any time of day! This post is sponsored by Nancy’s. All opinions are mine alone. It’s getting close to that time of year when many of us start thinking about menus for holiday parties and entertaining. Or, we just want to have something nice to serve as a snack to visiting family and friends. 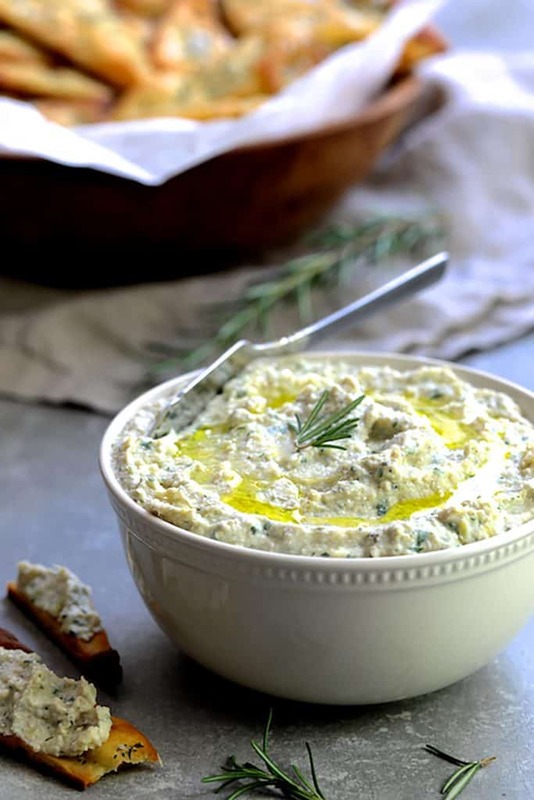 White Bean Artichoke Spread with Rosemary Sea Salt Flatbread Chips is your answer! 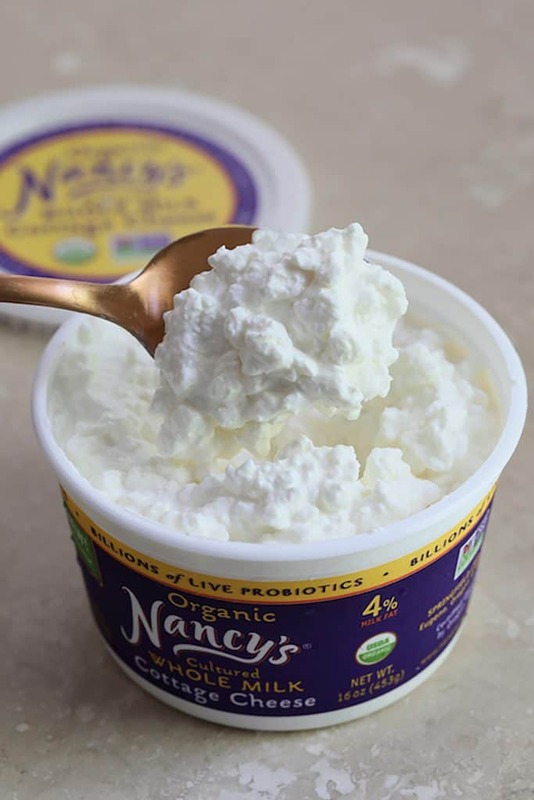 First, however, I want to tell you about one very special ingredient you’re going to want to have on hand to make this dish: Nancy’s Organic Cultured Whole Milk Cottage Cheese! I recently discovered Nancy’s and I’ve got to tell you, they make some really delicious dairy and nondairy products! Nancy’s products are made by the Springfield Creamery which is run by the Kesey family, just outside of Eugene, Oregon. Three generations strong, they’re celebrating their 57th year! They produce more than 100 cultured dairy and soy products. Springfield Creamery is a probiotic pioneer. They were the first U. S. brand to introduce live probiotic cultures into yogurt in 1970. Each of their products contains billions (yes, billions!) of live probiotics. Because Nancy’s is not “big yogurt,” they’ve never compromised their quality or their values. I noticed the quality as soon as I opened their cottage cheese–it’s super creamy, thick and rich! Now here’s a rustic yet elegant appetizer to keep in your recipe repertoire all entertaining season long! 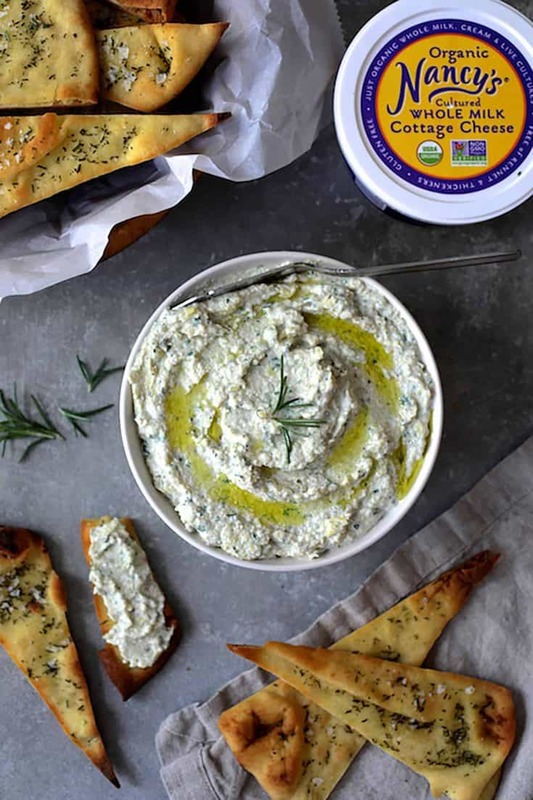 White Bean Artichoke Spread with Rosemary Sea Salt Flatbread Chips is perfect for any occasion. I used Nancy’s Organic Cultured Whole Milk Cottage Cheese. (However, if you prefer, they do make a cottage cheese that’s lower in fat.) It adds a delicate cheesy flavor with a light “whipped” consistency. 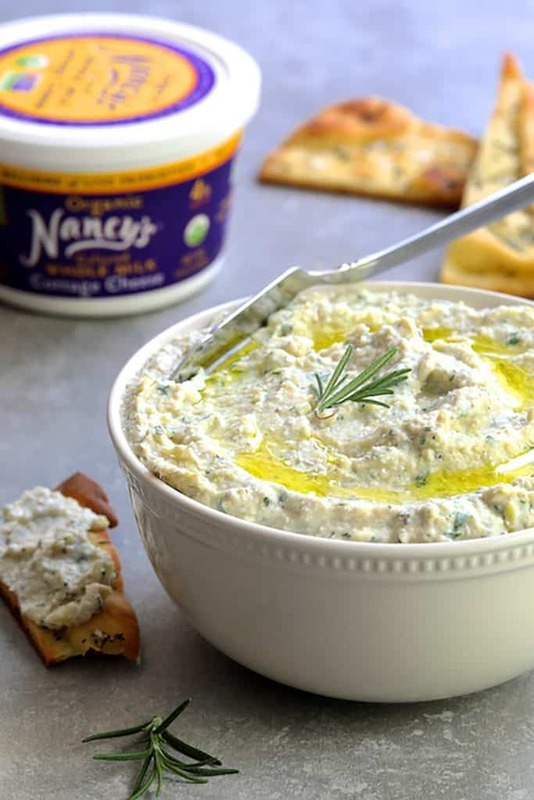 Nancy’s Cottage Cheese makes a great substitute for sour cream or mayonnaise in dips. You can make the spread up to two days ahead. The chips require only a little prep work and baking. However, you could also chop the rosemary ahead of time, place it in the olive oil and store in the refrigerator for up to a day. Allow it come to room temperature before brushing on the oil. The spread comes together quickly with the help of a food processor. Add one can of drained artichoke hearts along with all the other dip ingredients. Chop the other and add it last. However, just pulse to combine for texture. Drizzle a little olive oil over the top and that is IT! Seriously! 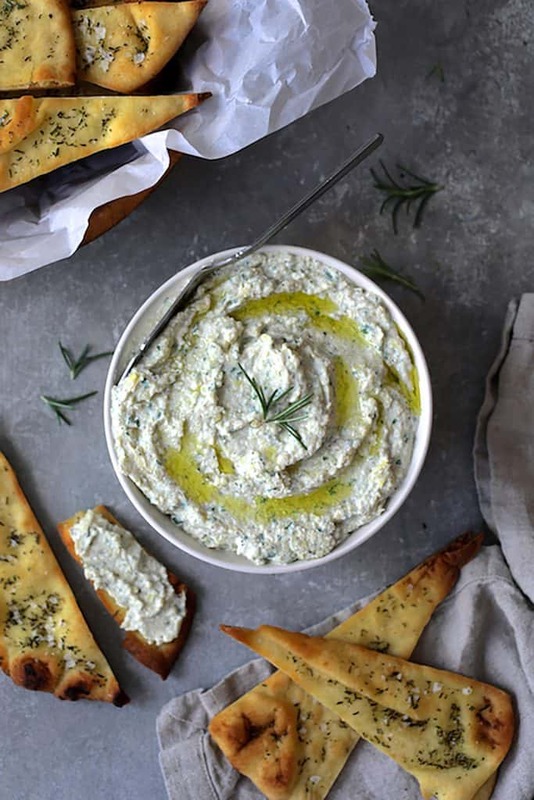 White Bean Artichoke Spread with Rosemary Sea Salt Flatbread Chips is oh so elegant and lovely! You’ll be proud to serve this to family and friends this holiday entertaining season! White Bean Artichoke Spread with Rosemary Sea Salt Flatbread Chips is an easy and elegant appetizer that's perfect for entertaining or wholesome snack any time of day! FLATBREAD CHIPS: Preheat oven to 400 degrees. 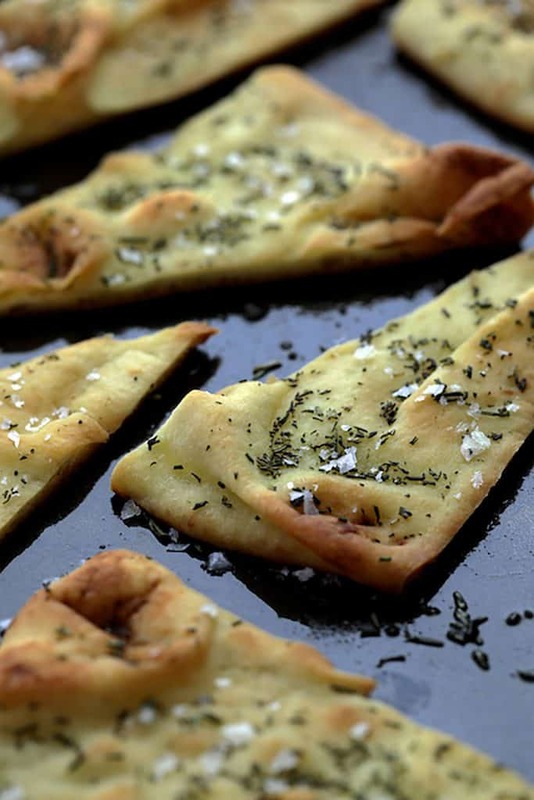 Cut each piece of flatbread into 6-8 pieces each. Place on a nonstick baking sheet. 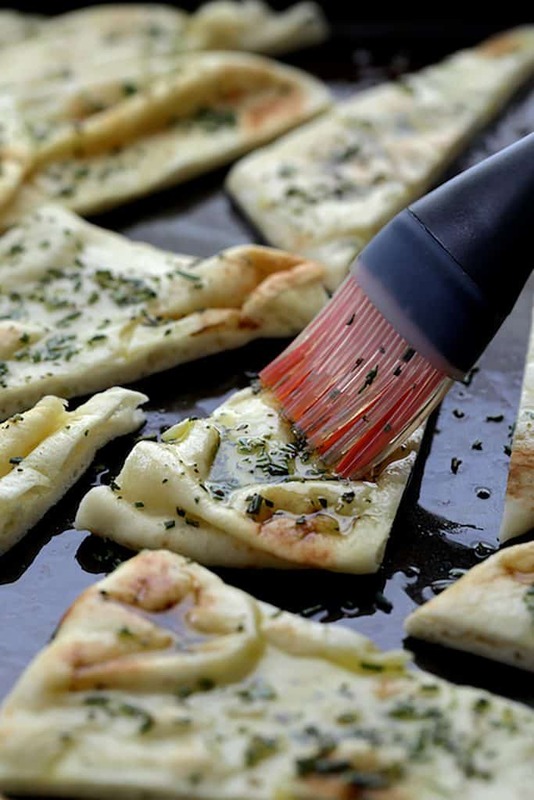 Brush each piece with olive oil, sprinkle with rosemary and coarse sea salt to taste. Place one can of artichoke hearts in the food processor. Coarsely chop the other and set aside. 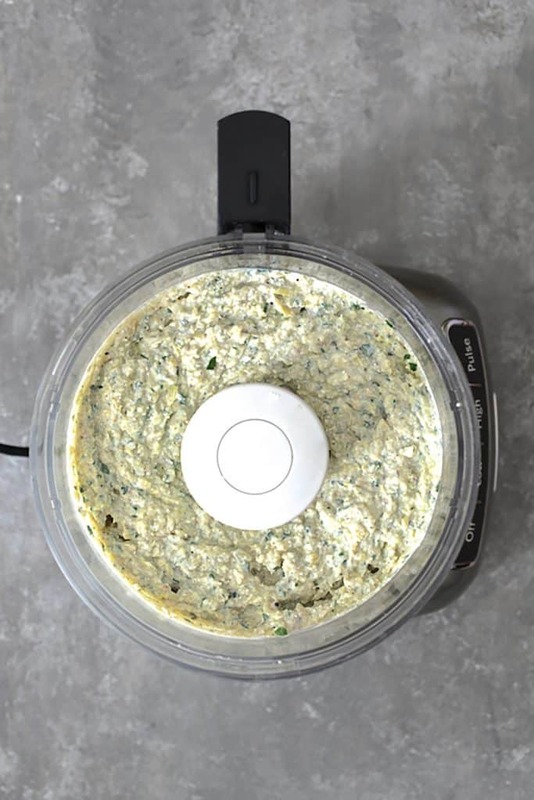 To the food processor add, beans, cottage cheese, garlic, parsley and Italian seasoning in a food processor. Process until smooth. Add the second can of artichoke hearts that you chopped and pulse to combine but don't process until smooth; leave some texture. Season to taste with salt and black pepper. Transfer to a serving bowl and drizzle with a little olive oil. Garnish with a sprig of rosemary. 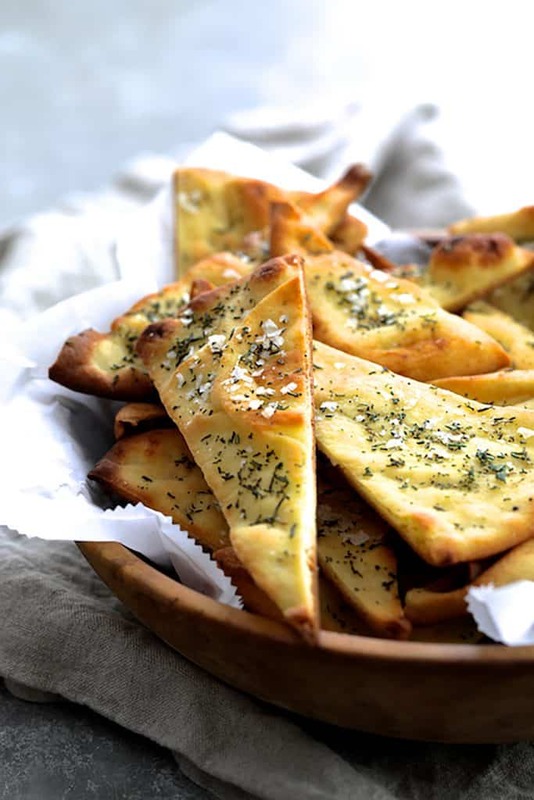 Serve spread with flatbread chips. Wondering if I could make this with ricotta instead of cottage cheese. Would it be too sweet? Hi, Rebecca, I think it would work, but do encourage you to try the cottage cheese. Nancy’s also makes cream cheese. I would opt for that before ricotta. Thanks so much for your great question. Let me know how it works. This dip has us drooling over here. Yum! Thanks so much! We enjoyed every bite! Headed to a going away party this weekend and have to bring a dip. This is going to be it! Thanks. Hi, Mary, Thanks so much and hope you enjoy! This looks like it would be a scrummy appetizer or snack.